Sara Liberte grew up the younger sister of an Army Ranger...she blames that for everything [awesome] in her life. Sara is a photographer and videographer with loads of talent and an utter disregard for inclement weather, arduous conditions, and the law of averages. Sara is an eleutheromaniac (ie. obsessed with freedom) who loves firearms, motorsports, motorcycles and any vehicle that gets dirty and generates adrenaline. She spent many years traveling the U.S. in a van called the Dodge Mahal, with her dog at her side (he also occasionally rides in a motorcycle sidecar with her). Sara recently laid that van to rest and started building a new "home." She choose Zamp Solar to power her "instruments of shooting" and anything else that needs power on the spot. Her 2017 GMC van is nearly finished and will soon be taking her on many more adventures to remote locations. If you need to find her, you'll definitely have to look outside… try moto-events, mountain ranges, or firearms classes. 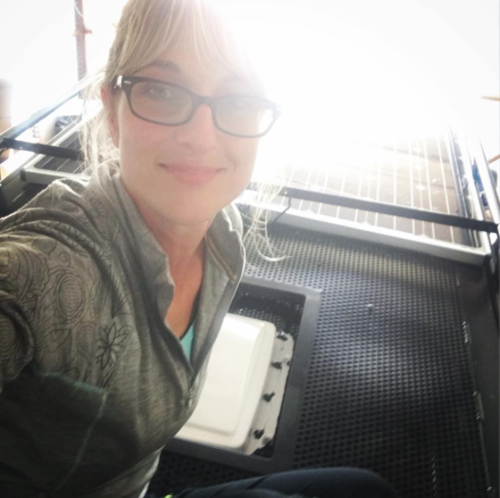 Sara uses our 170-Watt roof mount kit along with a 170-Watt expansion kit—together, the two kits provide 340-Watts of power. Since Sara often finds herself in the middle of nowhere shooting photos for Recoil and Off-Grid magazine, she depends on her Zamp Solar panels to keep her camera batteries, phone, and laptop charged, while also powering her small refrigerator and ceiling vent fan—everything Sara says she needs to live the life of her dreams.